Installment 3 in the 2013 Round-Up takes a melancholy look at some books which just didn’t do it for me. Still to come, Installment 4 highlighting some books which really hit the spot: Personal Favourites of 2013. 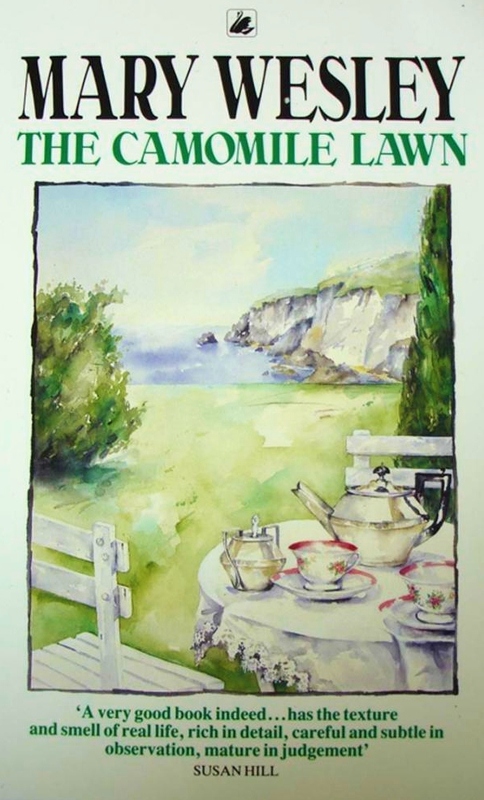 The Chamomile Lawn became a bestseller when it was first published in the 1980s, and much was made of the fact that the author, Mary Wesley, who apparently based much of the wartime narrative on her own experiences, was over seventy when it was released. A popular television mini-series broadcast in 1992 brought the novel to a much wider notoriety. I can understand the popularity of the novel, as it does have an ambitious scope, a tangled, soap-opera-like storyline, and a generous enough amount of sexual goings-on to pique the interest of the most reluctant and jaded of readers, but I’m afraid I did not embrace it fully. This might be partly editorial, as the phrasing often seemed awkward to me, and I never entered fully into the story, remaining very much an onlooker as the author soberly and without much flair matter-of-factly related the action with an abundance of smutty detail which couldn’t help but leave me squirming – and not in a good way. A complicated and vaguely incestuous (cousins all over each other) picture of lust, yearning and self-indulgence. The period details weren’t enough to make up for the unsavoury plot and stylistic deficits. Just to prove that I sometimes show desperately poor judgement in my reading choices, I willingly read not one, not two, but three books by the very prolific romance writer Phyllis A. Whitney this year. One of these, Seven Tears for Apollo, was reasonably decent, but these other two were absolute stinkers. 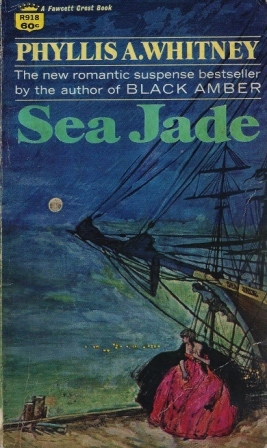 Sea Jade was a desperately gothic romance set in post-Civil War New England. Here’s our heroine. Breathless, gushing, suddenly orphaned Miranda goes on to have all the stock adventures of a gothic genre heroine. As soon as she seeks refuge with her late father’s old friend Captain Bascombe, she’s immediately forced into an unwelcome marriage with his widowed son. There are all sorts of family secrets, and of course her husband hates her and wants nothing to do with her, having married her under extreme duress. Dramatic deathbed scenes and mysterious Chinese wives and exotic swords and ill-begotten fortunes feature in the scenario. And there’s an intially-hateful-yet-ultimately-winsome child, a huge black dog named (of course) Lucifer, an unexpected will, a mysterious murder (or two)… In other words, the formula as usual. Points in favour were a certain amount of creativity in the historical bits involving the tea trade and the brief glory of the Yankee clipper ships. And also because the author used every cliché in the romance writer’s book, completely (I’m quite sure) without irony. One of those “so bad it makes everything else look good by contrast” reading experiences – a necessary thing in every reader’s life. Occasionally. Always, the brilliant island sun shines over Hampden House in St. Thomas and over Caprice, the plantation in St. Croix that is crumbling to eerie ruin, guarded by its unicorns. Always the threat of a hurricane looms over this exotic setting, where the past still affects the present. And so on. Read at your own peril! Much less gushing and emotional than Phyllis A. Whitney’s tortured heroines is this home-grown Canadian gal. Deborah Blair, a young librarian from Montreal, disembarks from a train at a remote way station in the Rocky Mountains near Lake Louise. The first thing she does is when the train pulls away is to strip off her city clothes, change into country duds, and pitch her suitcase and dress suit into the lake. Then she sets off on the 9-mile hike to the mountain holiday camp where she has secretly booked herself a holiday. Oh, hurray! Tell me more, I thought. But sadly that was about as good as it got. 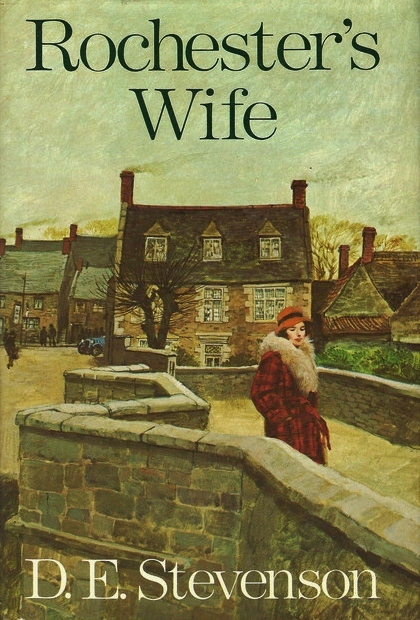 Deborah is fleeing from both an overbearing mother and a rotten, already-married lover, and both track her down to her mountain hideaway, but not before she has found enough self-fulfillment among the lofty peaks and has gained a certain amount of self confidence due to the appreciative embraces of several of her fellow (male) guests to tell them both (mother and lover) to go take a hike. Not a horrible book at all, and it had some good things to say about female self determination, but clunky styling, the plainest of prose, and an increasingly awkward plot kept it from reaching significant heights. 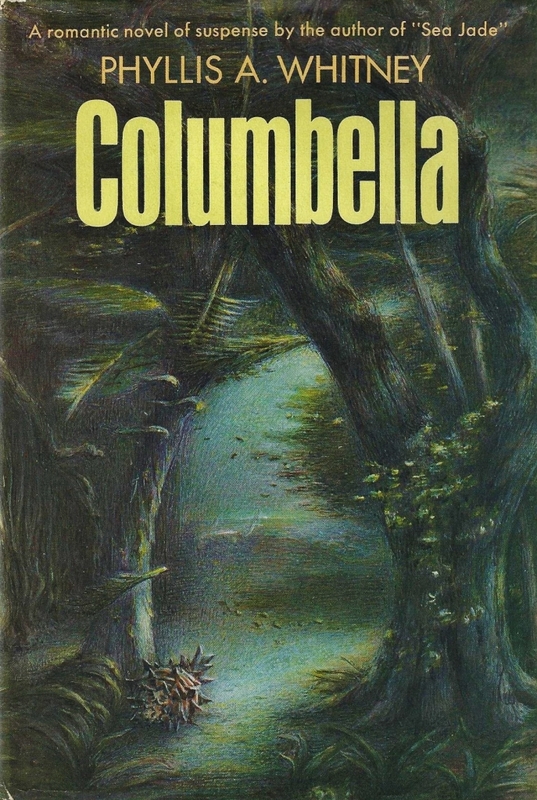 A keeper because of its vintage appeal and enthusiastically described Alberta setting, but disappointing because it could have been so much better with tighter editing, an expanded vocabulary, and less wooden characterizations. This recent bestseller started off with some promise. Recently retired Harold, stuck aimlessly at home with his sour wife, receives a letter from an old colleague which tells him that she is terminally ill. Harold hems and haws and eventually writes a rather pathetic letter of condolence. He sets off to walk to the mail box to send the letter, but is overwhelmed by a sudden urge to walk to see the doomed Queenie and deliver his message in person. While he’s walking, she can’t die, is his sudden superstitious thought. The catch is that she is ensconced in a nursing home some 600 miles away. But he trudges along in his light summer jacket and golf shoes, for days and days and days, compelled by an inner urge to make at least this one thing right in his rather gone-wrong life. 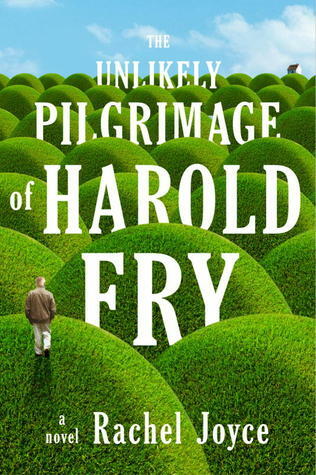 Sadly, very soon into Harold’s walk, the plot went all mawkish and droopy and all directions of highly unlikely as meaningful encounters with troubled but helpful people start to occur in quick succession, until at last an assortment of odd pedestrians start walking along with Harold in some sort of copy-cat pilgrimage having nothing to do with poor dying Queenie. I’m all into magical reality if it’s convincingly well done, but this one demanded more of my suspension of disbelief than I could possibly give. And the Big Sad Secret which was revealed at the end was so terribly boring, and the “life affirming” ending was so stereotyped that I was tempted to give the thing the toss-across-the-room treatment. It was only saved by the fact that it was a library book. Sorry about my rude dismissal, those of you who loved this one, but my dislike for the way this deteriorated from its early promise is savage and sincere. And checking out the one-star reviews on Goodreads showed that while I am part of a serious minority, I was not alone in my annoyed dislike. Long-listed for the 2012 Booker Prize? Was it really?! Oh. My. Gosh. Though I see (I checked) that it didn’t get to short-list status. Thank you, gods of literature, for that small mercy. I hate it when I quite like an author but then he/she turns out not just one or two but a whole string of sub-par throw-away books. Pearl S. Buck is a classic case of this, and I have long had a love-hate relationship with her work. When she’s good, she very, very good, but when she gets sloppy, she’s dire. Guess which category this novel – long novella(?) – falls into? It has an interesting premise, but the characters are all so smug and unlikeable that any sympathy for their situation I might have had soon evaporated. Here’s the plot. 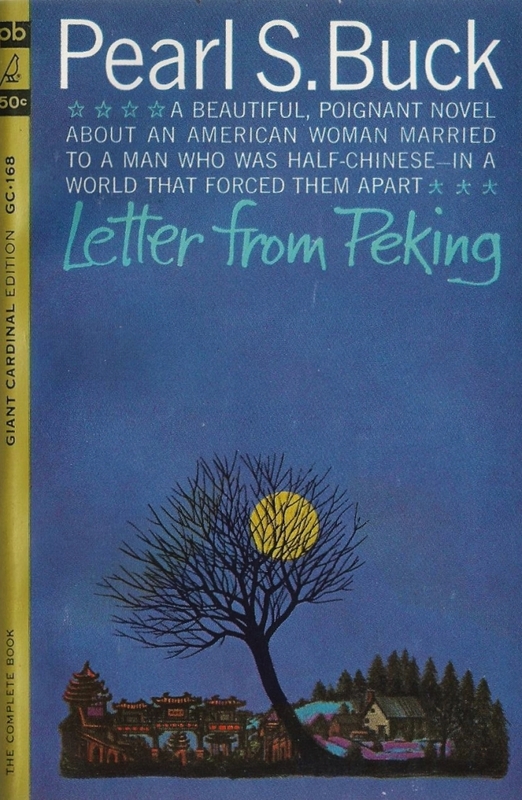 An American woman, happily married for twenty years to a half-Chinese, half-American man, leaves China with her twelve-year-old son at the start of the Communist government takeover. Her husband, due to an extreme sense of duty, remains behind in his job. The woman settles into her family home in rural Vermont, complete with faithful hired man. Communication is sporadic with China; years pass quietly. A letter arrives. Her husband has been pressured to take on a Chinese wife, to prove his loyalty to his country. The woman puts off answering it. The (mature teenage) son runs into issues with his mixed race ethnicity. The woman vapors about, meddles in son’s romantic affairs. She continually demonstrates extreme snobbism, and not-so-secretly rejoices that son’s fiancé is orphaned so she (the mother) will not have to interact with them. During all of this not one but two prospective suitors to the mother materialize. “Divorce your husband and marry again!” Oh, what to do, what to do???! By the time it all sort of resolved itself (sort of) I no longer cared. Meh. A very carelessly put together book, from a writer who can do much better. Those of you who are aware of my strong infatuation with the glorious Margery Sharp will be surprised to see her on the Most Disappointing list, but sadly, this book let me down. It’s not rotten, but it’s not up to par either. The plot – never admittedly a very strong point with this author – seems more befuddled than usual, and the characters did not engender any sort of a sympathetic response in my readerly heart. I didn’t really like any one of them, but neither could I work up a strong feeling of dislike. There they just kind of were, moving about randomly in fictional limbo. The plot description sounds better than the story turns out to be. Mr and Mrs Prelude are in a plane crash; Mrs Prelude walks away, but Mr Prelude perishes. Or does he? Convinced that she has possibly made a horrible mistake when viewing her husband’s body, Mrs Prelude theorizes that perhaps he is still alone, wandering in the Swiss mountains. The 16-year-old Prelude daughter decides to go and investigate for herself. A rather limp farce which doesn’t, like the ill-fated plane, quite make its destination. OK, I’ll repeat, it’s not a horrid book, and there are quite a number of wickedly funny moments. It’s a keeper, and I fully intend to re-read it and try to drum up some more affection for its good elements, but at this point I’d hate to recommend it as any sort of prime example of this accomplished author’s greater body of work. Here’s another writer whom I like quite a lot, but who sometimes lets me down. I don’t read these sorts of books for their hyper-realism – they are “cozies”, after all – but one does require some standard of verisimilitude. In Rochester’s Wife, with its strong reliance on insanity as a key plot point, one can’t help but feel that the author didn’t do her research. A young doctor decides to settle down in England after travelling about the world. There is much romance, none of it particularly appealing to read about, all forbidden love and rather limp yearnings. The already-referred-to episode of insanity is handled in a very bizarre manner by the author as well as the several doctors in the case. Even in 1940 I am sure the British medical establishment was more capable of treating psychoses in more effective ways than they appear to do here! One of the weakest of this author’s books I’ve read to date. Well, while I’m on something of a roll panning tales by authors I really, truly like, let’s spend a few minutes with Mary Stewart. I’ve read quite a few of her romantic-suspense novels this year, and have found my responses to be mixed. While I really do sympathise with her very capable and likeable heroines, and enjoy her detailed descriptions of settings, the de rigueur action sequences of many of the books, described in frame-by-frame photographic detail, drive me slightly mad. Panic-stricken girl in high heels etcetera manages to dodge ex-secret service trained killer etcetera while negotiating crumbling cliff/tiled castle roof/squelching Scottish bog/etcetera. Yup. Of course. Well, those sequences are really the whole point of the books, aren’t they? The menace keeps building until something has to give. And in most of the books I’ve read I’ve happily played along, rolling my eyes but taking it as part of the package deal. But these two pushed past my tolerance level for willing suspension of disbelief. 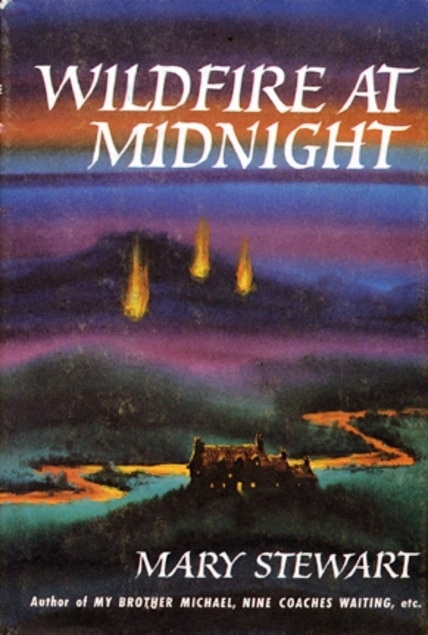 In Wildfire at Midnight, a gorgeous London model, separated from her husband, is maneuvered by her parents into taking a holiday on the Isle of Skye, ostensibly to escape the chaos of the Coronation festivities. Immediately upon arrival, who should lovely Gianetta meet but her estranged husband, who is ostensibly on Skye for a mountain climbing holiday. The two keep their prior acquaintanceship a secret from their fellow guests, which makes things quite awkward when a series of grisly murders puts the holiday-makers and rock-climbers at the remote country inn under strong suspicion. Bizarre and unlikely motive for the killings, continual stupidity of the heroine, and unlikeable love interest rather ruined this one for me, even before the mountain crag/quivering bog/Scottish mist chase scene. 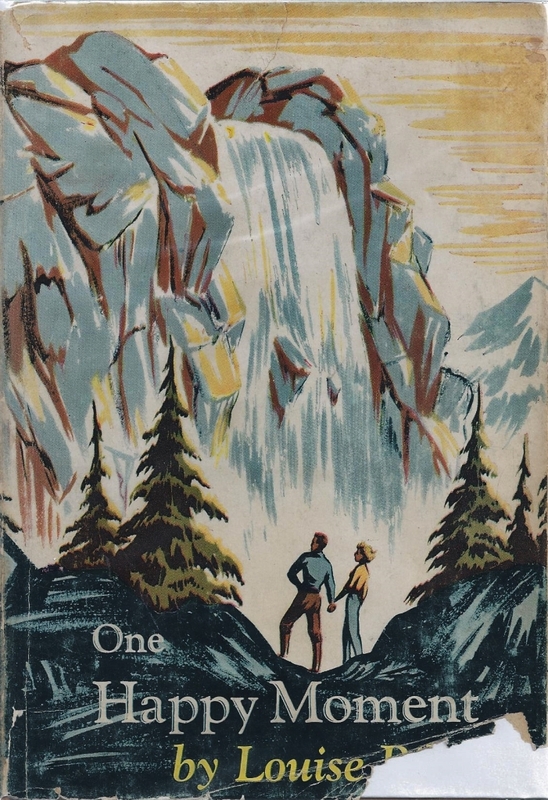 Salvaged by gorgeous descriptions of the settings and atmospheres of London and Skye, and the period verisimilitude of the characters crowding around the radio every evening in order to follow both the progress of Coronation festivities and Edmund Hillary’s attempt to climb Mount Everest, of particular interest to all of the rock climbers in the story. Nicely done, those bits. So what’s this one all about? Let’s see if I can sum it up briefly. A gorgeous young lady is in France and hopes to have a reunion with her older, recently-widowed cousin, who is apparently undergoing a retreat in a nunnery prefatory to taking vows. When the heroine arrives at said nunnery, she is told her cousin is dead and has been buried in the garden. “Something” tells the heroine that this is untrue, and that her cousin is alive. Luckily there is a handsome and rather brooding young man handy to aid the heroine in her search for the truth – and, by golly! – he is conveniently an old flame of the heroine’s, there in a remote corner of France by sheerest authorial hand-of-God. 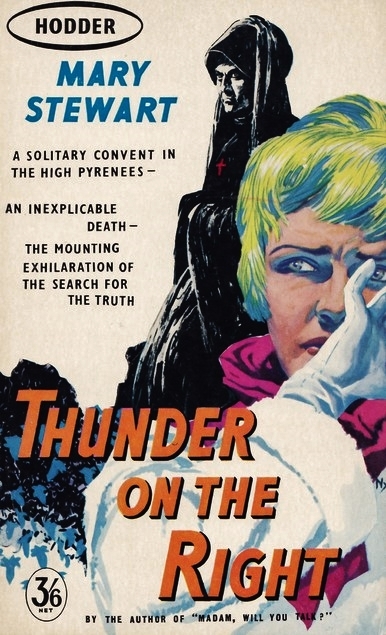 Evil nuns, a handsome local boy on a rampant stallion, a wicked smuggler, escaping criminals and much too much coincidence unite in making this one my own least favourite of Mary Stewart’s improbable (but usually highly enjoyable) romantic-suspense novels. 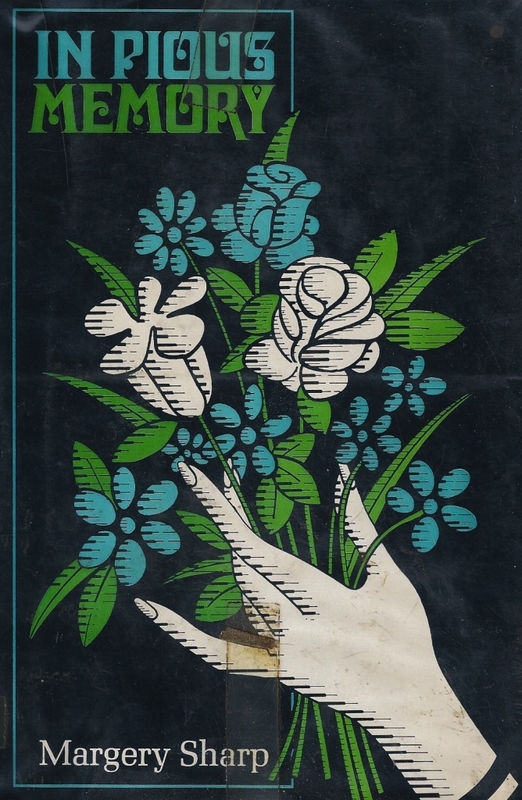 I became interested in this book due to my prior discovery of the author’s semi-autobiographical novel A Lamp is Heavy, concerning a young nurse’s experiences as probationer in a North American city teaching hospital in the early 1940s. 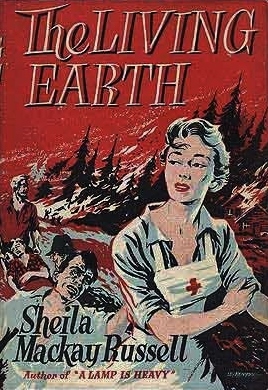 I was pleased to find out that Sheila Mackay Russell was an Albertan nurse/writer, who had a modest success with A Lamp is Heavy, and who went on to publish another novel, The Living Earth, also with a nurse as a main character. With some trouble I managed to acquire a copy of The Living Earth, and settled down to a happily anticipated read. 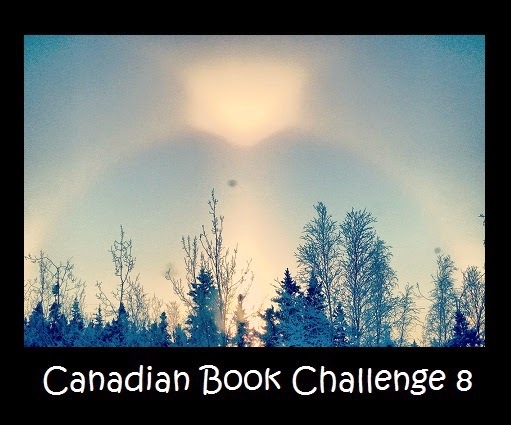 The story started out quite well, with a young nurse travelling by train to her posting in a remote northern Alberta community, “Mud Creek”. On the train is a fellow traveller, another young woman heading for the same community, to her posting as a school teacher. The two set up house together, and proceed to have all sorts of rather sordid experiences. Both attract rather unsavory lovers (married, alcoholic, manic-depressive, abusive etcetera) and much heart-rending ensues. This novel is of the hyper-realistic genre, and it could have been quite decent but for its rather awkward phrasing throughout, and its insistence on dragging out every single episode to the utmost of its interest level and then a little bit beyond. It’s also dreadfully bleak. And melodramatic. Bleakly melodramatic, in fact! I am not surprised that there is no third novel from this writer, though The Living Earth went through a number of printings which argues a certain success. 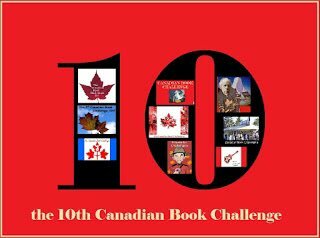 She did produce a number of short stories which were printed in the Canadian women’s periodical Chateleine, according to one of this blog’s readers. I never did write a review of this novel, because it so deeply disappointed me, despite its author’s undoubted good intentions of creating a true-to-life dramatic novel with a regional setting. I think that her motivation was praiseworthy, but sadly it didn’t quite come off. Possibly of interest to anyone studying womens’ experiences in northern Alberta in the 1940s/50s, but beware the fictional elements, which seemed to me to be many. 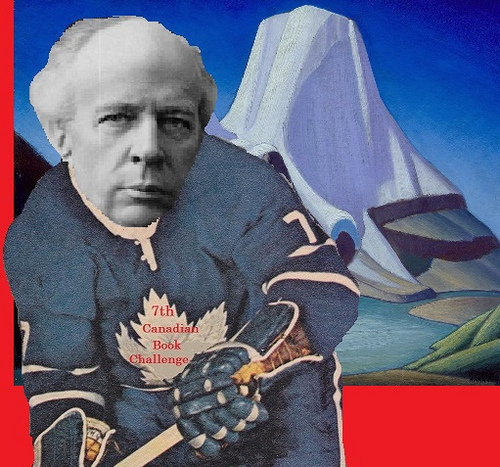 I could not find any other reviews of this now-obscure Canadian novel. 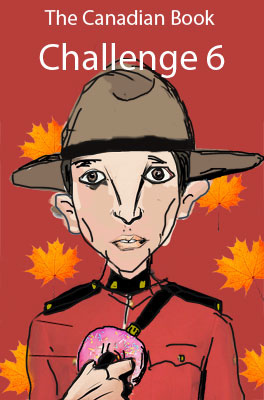 And here we have a truly Canadian memoir, this time by the popular C.B.C. radio personality and ex-Moxy Früvous drummer, Jian Ghomeshi. I had such wonderfully high hopes for this book, as I usually enjoy Jian’s interviewing style on his weekday pop culture talk-and-music program on the C.B.C., “Q.” He’s an interesting-sounding personality himself, and his frequent references to his own background as a child of Iranian immigrant parents growing up in Ontario in the 70s and 80s make him both relatable and slightly exotic, a public persona he nourishes with obvious care. But this memoir. Boring, boring, boring. It wasn’t that Jian didn’t have an interesting teenage life. He did, in a tame sort of middle-class, upwardly mobile, successful immigrant family sort of way. 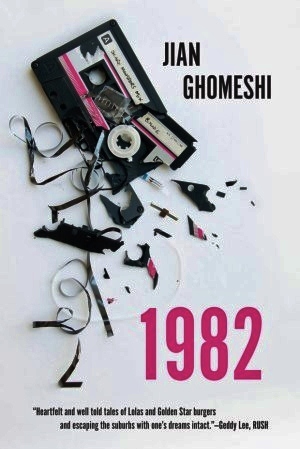 In 1982, the year more or less profiled in this “creative autobiography”, Jian turned fifteen. He was in the throes of young love, was hanging out with a bunch of good friends, and was playing drums in a band – okay, it was the community band, but still… He was listening to all sorts of cool new music, had reinvented himself as a New Wave wannabe, and was having quite a time experimenting with hair dye and styling gel and eyeliner and dressing all in black. He had a loving and supportive family, abundant parental funding, and oodles of positive reinforcement from his teachers and the other adults in his life. He did stuff. He went places. He got into a few interesting situations, and made it through them in one piece. Easily enough stuff to write a memoir about. A short memoir. A novella-length memoir. Not the almost-300 page thing that this turned out to be. Jian ran every single little incident of that year completely to death. And though it was interesting in bits here and there, ultimately I just couldn’t care. Much as I hate to do this, I need to add a “bonus” to this list. 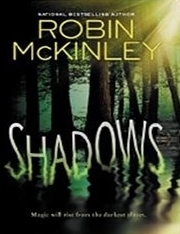 Shadows is the recently published “kind of like Sunshine, but for teens” fantasy by the iconic writer, and I had high hopes for it. Sounded good in the pre-publication discussions, and the early reviews were mostly favorable, though in retrospect I realize there were quite a few “buts” in some of those reviews. 17-year-old Maggie lives in a world where magic is forbidden, and when it sporadically shows up it is immediately squelched by squads of specially trained soldiers. People with magic in their genes are “cleaned” and re-released into the population; science takes care of everything in this world, thank you very much. So when it becomes apparent that there is a massive outbreak of the magic bulges called cobeys threatening to overflow into Newworld, Maggie is shocked to discover that she has some latent powers which work to contain the bad vibes. The author doesn’t bother explaining why magic is so nasty, and what will happen if it breaks through. She tells us it’s a really bad thing, and leaves it at that. But suddenly all of the “good” characters start showing varying degrees of magic powers which are obviously going to save the day. From, umm, something. Extra Disappointing points for the annoying first person narrating heroine and her endless rambling on about how wonderful she is to understand all the nice little animals she loves so very much and how thick the adults in her life are and how hard algebra is and how amazing her origami skills are and how cute and clever her pop culture Japanese slang is. Please forgive me, those of you who liked this book. I’m a long-time McKinley fan too, and I hate to slam her work, but this one wasn’t quite ready to see the light of day, in my opinion.